Fifty years after its original publication, Catch-22 remains a cornerstone of American literature and one of the funniest—and most celebrated—books of all time. In recent years it has been named to “best novels” lists by Time, Newsweek, the Modern Library, and the London Observer. Set in Italy during World War II, this is the story of the incomparable, malingering bombardier, Yossarian, a hero who is furious because thousands of people he has never met are trying to kill him. But his real problem is not the enemy—it is his own army, which keeps increasing the number of missions the men must fly to complete their service. Yet if Yossarian makes any attempt to excuse himself from the perilous missions he’s assigned, he’ll be in violation of Catch-22, a hilariously sinister bureaucratic rule: a man is considered insane if he willingly continues to fly dangerous combat missions, but if he makes a formal request to be removed from duty, he is proven sane and therefore ineligible to be relieved. This fiftieth-anniversary edition commemorates Joseph Heller’s masterpiece with a new introduction by Christopher Buckley; a wealth of critical essays and reviews by Norman Mailer, Alfred Kazin, Anthony Burgess, and others; rare papers and photos from Joseph Heller’s personal archive; and much more. Here, at last, is the definitive edition of a classic of world literature. 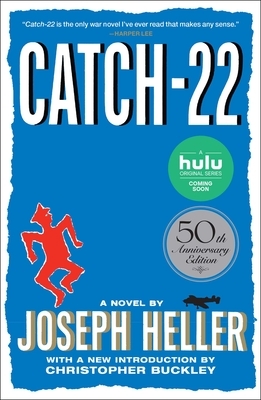 Joseph Heller was born in Brooklyn in 1923. In 1961, he published Catch-22, which became a bestseller and, in 1970, a film. He went on to write such novels as Good as Gold, God Knows, Picture This, Closing Time, and Portrait of an Artist, as an Old Man. Heller died in 1999. Christopher Buckley is a novelist, essayist, humorist, critic, magazine editor, and memoirist. His books include Thank You for Smoking, The Judge Hunter, Make Russia Great Again, and The Relic Master. He worked as a merchant seaman and White House speechwriter. He has written for many newspapers and magazines and has lectured in over seventy cities around the world. He was awarded the Thurber Prize for American Humor and the Washington Irving Medal for Literary Excellence.